Record: Baby Let's Play House / I'm Left, Your Right, She's Gone. 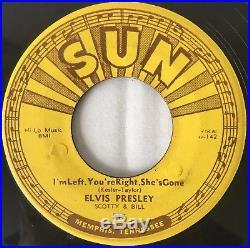 Elvis' 4th release with Sun Records. Push Marks readily visible with this original delta pressing by Memphis Plastic Products. Still retains much original gloss with scattered light marks. Great day and welcome to another Radocity Records listing out of Austin, Texas, the live music capitol of the world! Your satisfaction is our motivation. As with all Radocity Records listings, the aim is transparency. We are here to answer them! For each listing, we assign two separate grades... One for the sleeve/ label, and the other for the vinyl. For clarity when grading records, Radocity Records will use the following adapted system. Still Sealed [SS]: New / Unopened. I don't use this grade. The record shows no obvious signs of wear. An LP jacket has no creases, folds, seam splits or any other noticeably similar defects. The same is true of any other inserts, such as posters, lyric sleeves, and the like. Basically, Near Mint looks as if you just got it home from a new record store and removed the shrink wrap. 7 Very Good Plus [VG+]. Shows some signs that it was played and otherwise handled by a previous owner who took good care of it. Record surfaces may show some slight signs of wear and may have slight scuffs or very light scratches that don't affect one's listening experience. Slight warps that do not affect the sound are OK. The label may have some ring wear or discoloration, but is should be barely noticeable. The center hole is not misshapen by repeated play. Picture sleeves and LP inner sleeves will have some slight wear, lightly turn-up corners, or a slight seam-split. In general, if not for a couple of minor things wrong with it, this would be Near Mint. All but the most mint-crazy collectors will find a Very Good Plus record highly acceptable. Many of the defects found in a VG+ record are more pronounced in a VG disc. Surface noise is evident upon playing, especially in soft passages and during the song's intro and fade, but will not overpower the music otherwise. Groove wear will start to be noticeable, as will light scratches deep enough to feel with a fingernail that will affect the sound. Labels may be marred by writing, or have tape or stickers (or their residue) attached. The same will be true of picture sleeves or LP covers. However, it will not have all of these problems at the same time, only two or three of them. 5 Very Good Minus [VG-]. Good does not mean dead, but does mean getting rough! 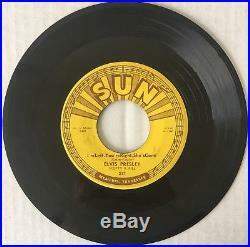 A record in Good or Good Plus condition will play through without any skips, but will likely have significant surface noise and scratches and visible groove wear. A jacket or sleeve has seam splits, especially at the bottom or on the spine. Tape, writing, ring wear or other defects will start to overwhelm the object. The record is cracked, badly warped, and won't play through without skipping or repeating. The picture sleeve is water damaged, split on all three seams and heavily marred by wear and/or writing. The LP jacket barely keeps the LP inside it. Inner sleeves are fully seam split, and written upon. 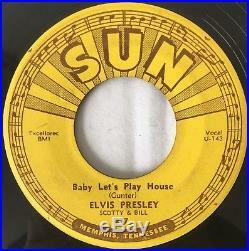 The item "SUN 217 Elvis Presley Baby Let's Play House / Left Right Gone 45 VG DELTA PRESS" is in sale since Wednesday, August 15, 2018. This item is in the category "Music\Records". The seller is "radocityrecords" and is located in Austin, Texas. This item can be shipped to United States, Canada, United Kingdom, Denmark, Romania, Slovakia, Bulgaria, Czech republic, Finland, Hungary, Latvia, Lithuania, Malta, Estonia, Australia, Greece, Portugal, Cyprus, Slovenia, Japan, China, Sweden, South Korea, Indonesia, Taiwan, Thailand, Belgium, France, Hong Kong, Ireland, Netherlands, Poland, Spain, Italy, Germany, Austria, Israel, Mexico, New Zealand, Singapore, Switzerland, Norway, Saudi arabia, Ukraine, United arab emirates, Qatar, Kuwait, Bahrain, Croatia, Malaysia, Barbados, Bangladesh, Bermuda, Brunei darussalam, Bolivia, Ecuador, Egypt, French guiana, Guernsey, Gibraltar, Guadeloupe, Iceland, Jersey, Jordan, Cambodia, Cayman islands, Liechtenstein, Sri lanka, Luxembourg, Monaco, Macao, Martinique, Maldives, Nicaragua, Oman, Pakistan, Paraguay, Reunion.